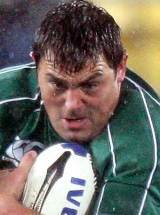 Giant prop Tony Buckley joined Munster from Connacht in 2005, but his early years with the Irish giants were dogged by persistent injury problems. At the end of the 2007 season Buckley was heavily linked with a move to English Premiership side Bath, but he chose to remain with Munster. In April 2007 Buckley was included in Ireland's squad to tour Argentina over the summer. Buckley won two caps on tour before returning to secure increased game-time for Munster during the 2007-08 season. Buckley was called into the Ireland World Cup squad as cover for Simon Best, who was forced to retire after discovering an irregular heartbeat, although he did not feature due to Ireland's group-stage exit from the tournament. Buckley made his competitive debut as a replacement against Italy in the 2008 Six Nations, making four further appearances during the tournament and also winning two caps from the bench against Australia and New Zealand on Ireland's summer tour. Buckley won his first start against Canada in the 2008 autumn internationals, before featuring from the bench against New Zealand. And over the next couple of years, Buckley remained firmly in the Ireland reckoning. Althought his first group of appearances came from the bench, Buckley continued to impress for Munster - picking up a couple of Heineken Cup medals in the process - and he even marked his first start for the national side against Canada with a try. He will join Sale for the 2011-12 Premiership season, but his arrival in Manchester will have to wait until after the World Cup due to him being named in the 30-man squad for the tournament.